It is a song familiar to anyone who has wandered into a pub at this time of year. 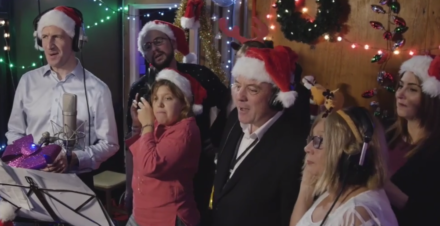 Now, however, one of the most famous Christmas tunes has been worked by a group of Labour MPs as part of a campaign on workers’ rights. Siobhain McDonagh has led a group of MPs in a new version of Do They Know It’s Christmas, the band aid classic first recorded by Band Aid. The Mitcham and Morden MP brought together a group including Dan Jarvis, Mary Creagh and shadow education secretary Angela Rayner to sing the seasonal classic in order to raise awareness of the way some companies have used the introduction of the national living wage to cut overall pay, as well as pensions and other benefits. All this comes as in-work poverty increases under the Tories. B&Q was one of several big retailers to cut some rates of pay when the national living wage was introduced – although the DIY chain responded to criticism by saying that no staff would lose out. McDonagh estimates that more half a million people across the private sector could receive a pay cut as a result of the changes. The backbencher wrote for LabourList in April about the government’s living wage “con”.